China's first Mars simulation base opened to the press on Friday in Gansu Province in the northwest of the country, providing a glimpse of the project mainly intended to popularise space among youth. The base is located in the Gobi Desert, 40 kilometres away from the downtown area of Jinchang, a city in Gansu. The natural features, landscape and climate are being described as resembling Martian conditions. The newly-built base has an extravehicular site and nine modules, including an airlock module, a general control module and a bio-module. "[The base] has several sections. It can tell us how to survive in severe environment when we arrive in the Mars, including such questions as where we can stay, where we can do scientific experiments to serve the globe and which experiments are more valuable," said Tian Rusen, an expert on space and science outreach. 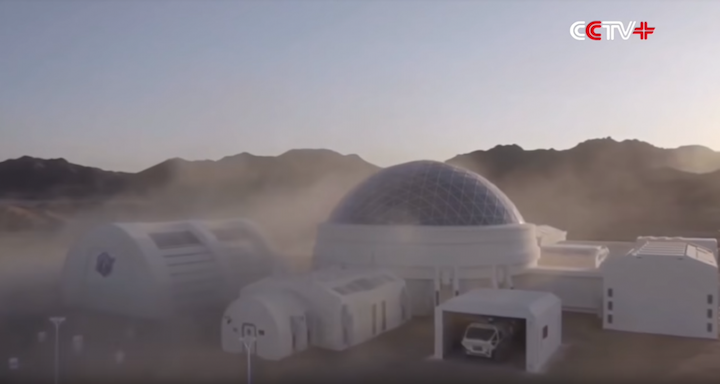 China’s first Mars simulation base opens to the press in northwest China. The base will be turned into China's first cultural and tourist experience base for space and astronomical education, Mars-themed tourism, scientific research and film shooting, according to CCTV. "It can give the kids a feeling that could have in the Mars, and make them learn that high technology can lead the society forward," said Tian. Some level of criticism within the Chinese science community has been expressed over the base's location and focus on tourism possibilities over value as an analogue site. The base is a part of the country's 'C Space Plan', a project of space education for Chinese teenagers, which was launched on Friday in Jinchang. The plan will involve making a space science reality show, a space themed film, a documentary, cultural and creative space-derivative products, research and experience camps and more to promote space to the country's youngsters. Such schemes are likely linked to the 'China space dream' derivative of Xi Jinping's 'China Dream' slogan, and seek to bolster support for the ruling Communist Party through the promotion of the country's achievements and ambitions in space. Since 2016 China has held an annual 'Space Day' on April 24 to celebrate the country's achievements, with the date chosen to mark the anniversary of the launch of China's first satellite, Dondfanghong-1, in 1970.